First published in 1860, The Mill on the Floss is a classic novel of development that follows the lives of Tom and Maggie Tulliver as they grow to adulthood in the small rural village of St. Ogg's, England. The Mill on the Floss, first published in 1860, tells the story of Maggie Tulliver and her brother Tom as they grow from children to young adults in the small rural town of St. Ogg's, England. Intelligent and passionate, Maggie yearns to develop her mind and break free of the constraints of her provincial village. Though she loves her brother above anyone else, Tom's rigid, pragmatic personality often conflicts with Maggie's headstrong nature, with increasingly tragic consequences. 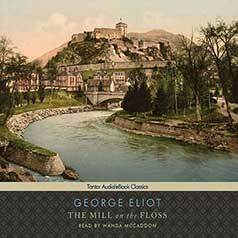 A classic novel of development, The Mill on the Floss is George Eliot's most autobiographical work. Through the characters of Tom and Maggie, Eliot examines themes of gender, education, and personality formation, and her portrayal of the town of St. Ogg's is both a brilliant depiction of provincial narrow-mindedness and constraining social norms and an intelligent commentary on the changes to rural life brought about by the forces of industrialization. The Mill on the Floss is an enduring portrait of love, family, and individuals striving to create their own destinies, one whose words and characters resonate as vividly today as they did for Eliot's first readers.